Many machinists, production managers, and other shop floor workers wish they had paperless manufacturing. It feels like an impossible pipe dream to them. It may be trendy to do so, but we wish to quote organizational expert Marie Kondo. Her insight is wonderful when thinking of taking on the daunting task of going paperless. 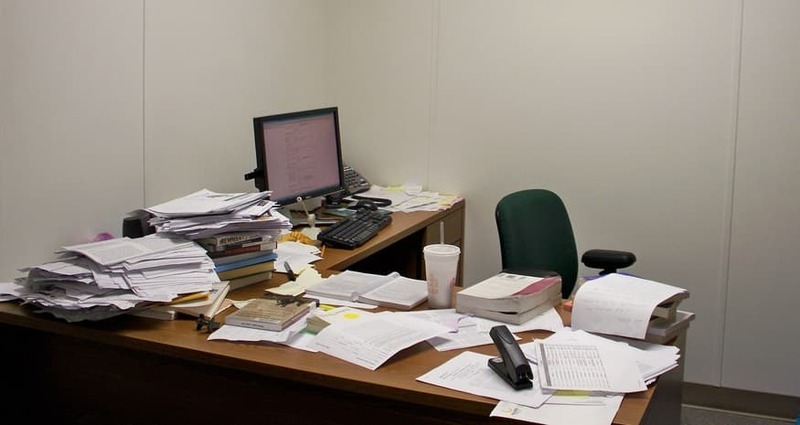 Other than the need to be organized, there are far more important reasons to go paperless. Digital revision control, being prepared for audits and keeping track of crucial documentation also weigh heavy on our daily processes. Yes, the task of going paperless can take time. But it is not an impossible task. Shop Floor Automations has even successfully gone paperless! There is also a terrific article written by Eli Plaskett of Modern Machine Shop on this topic. His December 2018 piece “Turning the Page on the Paper Workplace” details a few steps to achieve this goal. First, analyze how to give your workforce digital access to files as appropriate. Invest in a scanner – for existing paperwork and whatever paperwork comes in the hereafter, scan immediately. Train employees to get into the habit of scanning. Then, install tablets, network computers or digital station work devices. The next step is to train the workers fully on how to use the system. Show them the ways the system works for their benefit to save time. Set up simple instructions such as photographing a setup. If you use ERP Software (which integrates with quite a few of our solutions), it can often have tools to enable photos attached with set up instructions or photos via an ERP smartphone app. SFA has many solutions to help you cut your dependency on paper. We have USB hardware that can store programs in flash drives, and we highly recommend investing in PDM. What is lean production? One can view it as an alternative term for lean manufacturing, but we wanted to take a deeper look. “Lean production is centered on determining what activities or processes add value by reducing other aspects,” this Techopedia article explains. So there is our concept: instead of focusing purely on the bad (what processes to get rid of), we choose to focus on what is working. What can we magnify in order to increase production? The first part of the equation is always your talent on the shop floor. Without people at the equipment doing the work, nothing happens. So how can we help? “In lean-production systems, a manufacturer’s employees are organized in teams,” this Economist article explains. The article goes on to explain how the team structure works. Lights Out Manufacturing – This will require a specialized team to evaluate where there are snags in the process in order to do 24/7 machining. Especially if you have team members who work different shifts, this helps them to compare data and see what is happening. CNC Revision Management – Assign a team to investigate if programs are floating around the shop floor that needs to be better controlled. This team will help make sure old revisions aren’t running at machines. Going Paperless – Have a team designated to help the shop floor go paperless. Take on a system of real-time dashboards versus spreadsheets or whiteboards. This team can even help the front office out for a real sense of teamwork. For solutions that will help with these team goals, contact SFA. Call (877) 611-5825 or fill out a contact form today. CNC Revision Control is overlooked on the shop floor. Raw material and time are wasted when old programs run at machines. This definition is from Techopedia. Benefits of this concept include better record keeping, performance analysis, collaboration, and more. Modern Machine Shop columnist Wayne Chaneski says evaluating shop floor programs is crucial for success. Before retiring from Buck Knives, Shop Floor Automations customer Lee said this was a daily battle. Because of issues with programs, it was a productivity roadblock. “We had programs pretty much stored everywhere,” he said. “What we needed to do was lock down the programs,” Lee stated. Buck Knives resolved their issues, and they weren’t alone. “We were trying to control over 8000 programs, revision levels, and updates,” says Wayne of Carrol Machine. Revision control helps the shop minimize the time and mistakes of manual program management. Revision control also allows for grabbing programs from the right directories. Ready to start the conversation about your manufacturing equipment? Call (877) 611-5825 or fill out a contact form today! The following is an archived copy of our May 2018 newsletter sent May 22nd. Subscribed, but not receiving newsletters? Get more info on this page! Does getting your shop floor paperless, organized, ready for an audit, and functioning sound impossible? Trust us. It’s not. The Predator Software Suite contains a solution called PDM, or Production Data Management. You can use PDM to organize programs, safety procedures (such as lockout/tagout and other OSHA standards), setup sheets, quality documents, and more. Use PDM to help obtain revision control, as well as to finally go paperless. Every department can find a benefit from PDM. Whether they work in engineering, programming, or quality – everyone on the shop floor has a reason for document control. Especially when auditors will be checking if you have management and sign-offs for your processes and files, this solution is especially crucial. PDM will integrate with other pieces of the Predator Software Suite, such as DNC (CNC networking software), CNC Editor, MDC (Machine Data Collection), and Tool Tracker. It will also integrate with ERP and MES software systems. Seeking out CAD/CAM software for your growing manufacturing operation? Especially one that can integrate with our solutions? BOBCAD is a CAD/CAM company we have been working with for quite a few years. Especially since it integrates with some of our most popular solutions, such as DNC software, machine monitoring software, and our USB Connect hardware. Yes, it will even integrate with the PDM software mentioned above! Click the photo to see the full detail of these hilarious CNC control operator buttons! Everyone works differently on the shop floor. 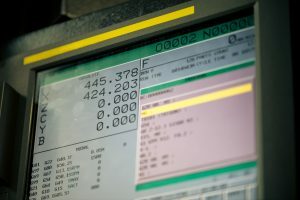 Some machinists use sticky notes, or custom stickers on machines, other use full sheets of paper to leave notes, and there are others who embed reminders in their coding. 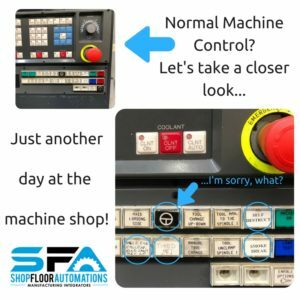 That being said, here are some funny CNC control photos we have seen over the years! SFA has serviced all manner of manufacturers over the years. 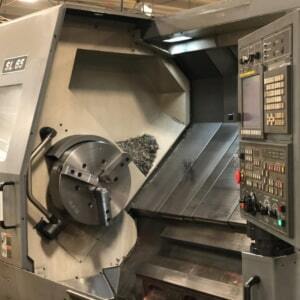 We have helped increase productivity for CNC machinists, fabricators, moldmakers – you name it! We are also fascinated with the #instamachinist movement on Instagram. Read more below! As a manufacturer, you have a lot of daily concerns, such as downtime and productivity. Is your manufacturing ROI an issue that is falling to the wayside? With a new year coming up fast, your ROI (or return on investment) should be bumped up to one of your largest concerns, if it is not already. You may remember when we did a previous blog explaining different types of costs for a manufacturer. For this blog post, we wanted to take the time to explain the top 3 ways that working with a manufacturing integrator like Shop Floor Automations will help you with ROI! The only time you ever want the amount of money you are spending on raw materials to go up is because your productivity is at sky-high levels. Unfortunately, you may be spending a lot on raw materials due to downtime on the machine interfering with the quality of products. 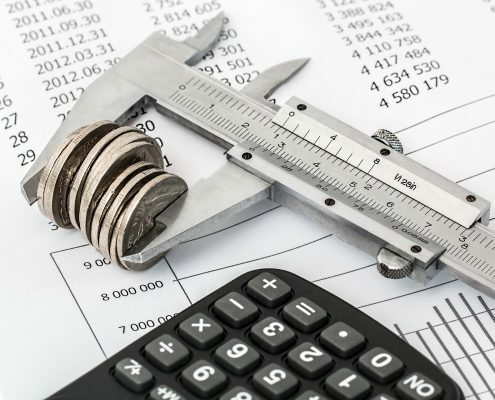 You may even be spending a lot on paper for spreadsheets and other shop floor documents. Using tools such as machine monitoring software can help you increase utilization of machines, and combining products like job scheduling software and PDM software can help you go paperless. Do you still use floppy disks or constantly invest in CAT-5 cable that needs to be replaced and restrung once a year? Invest in new hardware that will replace these processes and old media sources. These solutions should help bring down some significant procurement costs. Manufacturing is one of the most time-sensitive processes in the world. Certain quantities need to be done perfectly and they need to be on time. What happens when downtime takes down one of your machines? Or you have to spend time manually updating spreadsheets for your production schedule? Or your CNC’s have communication failures on a regular basis? Using the tools of DNC software for CNC communications, machine monitoring for combatting downtime, and graphical job scheduling to be able to see production changes in real time, all make for the perfect trinity to help jobs get out to customers on time. American manufacturing is coming back to a place of significant prominence. While the industry deals with a skills gap combined with reshoring, you need to make sure you can take on as many jobs as possible to stay ahead of the competition. If you spent less time updating spreadsheets, invested in less overtime to fix human error and were able to prevent more downtime on your shop floor, imagine how many more jobs you can take on. Implementing any of the tools mentioned above can help with productivity and cement your place in this industry as a top manufacturer. v11.0.241 (June 8, 2017). Chinese, Japanese, and Korean style reports added. 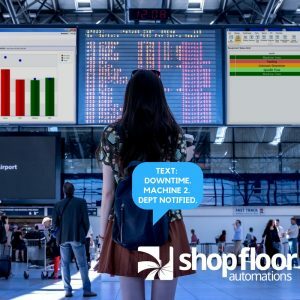 Improvements made to MDC Service Manager, View Machine Status, View OEE Status, Chinese language resources, Production Trend Analysis Chart display, and more features. Bugs fixed and more improvements made. Android compatibility was also improved for MDC in late June 2017. On July 16, 2017 – Predator Tracker v11.0.55 was released. Same as PDM – FIPS compatibility with FLM v11.0.0.2. improved. New imports and API abilities added. Improved process for Check-in/Check-out to Departments, Locations and Groups. Bugs fixed with View Components reports, editing tool rework operation definitions, and more. On July 15, 2017 – Predator PDM v11.0.174 was released. FIPS compatibility with FLM v11.0.0.2. improved. Part serial number permissions, importing manufacturing/quality requirements, online help, and PDM APIs have been improved. Bugs fixed with assigning icons to custom commands, and more. There have also been updates for Predator CNC Service, Predator Travelers, and Predator FLM over the summer. If you would like more information, please contact SFA by calling (877) 611-5825 or fill out a contact form at this link. Customers on software maintenance can download v10.0.191 of Predator PDM from our downloads at any time. 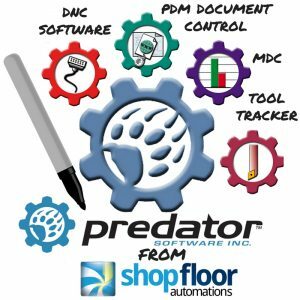 Customers running v9 or older of Predator PDM should contact Shop Floor Automations for upgrade details and pricing. Read more below. 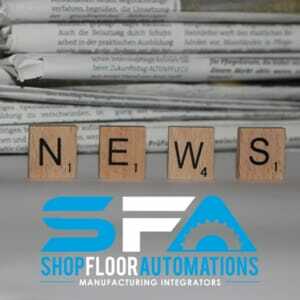 La Mesa, CA – April 4, 2012 –Shop Floor Automations (SFA) has announced the release of the newest version of its shop floor PDM solution, Predator PDM version 10. Version 10 of Predator PDM offers the most extensive expansion of features of any version yet, according to the company. Features include: direct integration with Predator DNC systems, including systems utilizing Remote Request; improved integration with Predator MDC (Manufacturing Data Collection) systems; expanded workflow, approval control and history options; new and improved bar code and RFID integration options and unlimited flexibility in definition and naming of PDM vault elements. “All previous PDM systems have been designed and built with CAD & CAM files and design departments in mind and as such, have rarely been a good fit for controlling access to files on the shop floor,” said a company spokesperson. “Predator PDM is designed to be much more flexible than traditional PDM systems while still retaining the ability to provide absolute control over what files are being used on the floor and capturing a history of those files’ use as well.